Close to the well known Kyoto Teramachi shopping arcade, parallel to Shijo-dori, there’s a street that deserves to be visited by any tourist in Kyoto: Nishiki Ichiba, the Nishiki Food Market. 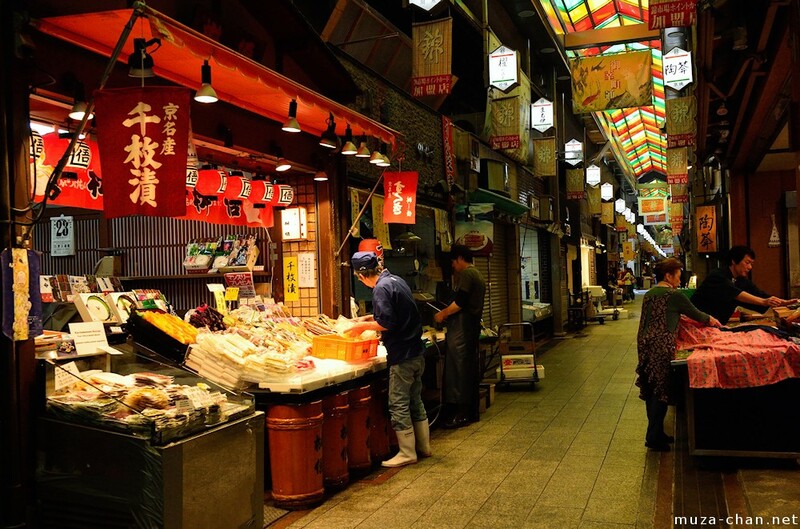 Established 400 years ago as a fish market, it has maintained its original profile and expanded to become an amazing example of the large diversity of Japanese traditional food products. You will find here, lining the sides of a narrow arcade, approximately 130 stores selling meat, rice, vegetables, dried seafood, traditional Japanese sweets, rice crackers, Japanese pickles (tsukemono) and condiments, plus some shops selling knives and cookware. The sellers are friendly (and some of them are direct descendants of the original store founders) and the traditional decorations are adding to the old-time charm.